Food: Cajun food of your dreams. Generally, in my search for cool, new places to eat and drink, I try to avoid touristy restaurants. They suffer the same fate as corporate chains – their food is a race to the bottom, the lowest common denominator that will appeal to the broadest masses. And if a tourist doesn’t like it, who cares? It’s not like they’re ever coming back anyway. But there can be exceptions to this “no tourist traps” rule. Sometimes a place can be popular with tourists because it doesn’t have tourist appeal. That describes Prejean’s to the ‘t’. A family from New Jersey with the mother-in-law in tow aren’t going to be barreling through the backwoods and bayous of Louisiana looking for some shrimp boil shack or fish camp. They want a quick taste of Cajun in a setting that makes them feel like they’re pretending to be dining in the bayou—you know, without the monstrous mosquitoes, swamps, and toothless roughnecks leering at their daughters. Me, on the other hand? Yeah, that’s exactly what I’m looking for. That’s why they come to Prejean’s. Conveniently located right on the I-49 frontage road in Lafayette – the mother city of Cajun Country – Prejean’s offers every out-of-towner exactly what they’re looking for in a bona fide Cajun restaurant. 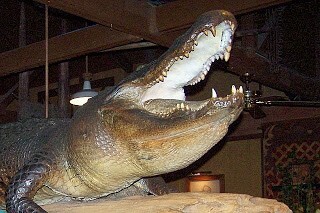 They’ve got a giant stuffed gator when you walk in the door, the ceiling and walls decorated like a Louisiana bayou, a Cajun band playing their hearts out, and the requisite display of T-shirts, coffee mugs, magnets, and postcards—you don’t have to feel the least bit embarrassed asking for a souvenir. Heck, they’ve even got a live web-cam so you can wave to your family back home while you stuff your face with crawfish and catfish. 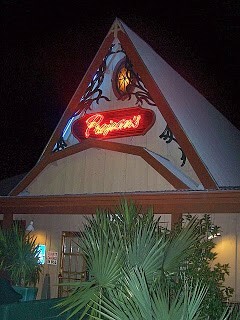 No doubt about it, Prejean’s is a fun, distinctive way to experience Cajun cuisine. And boy do they do it well. Apparently, the locals agree. There was a nice mix of tourists and natives on the Friday night I was there. 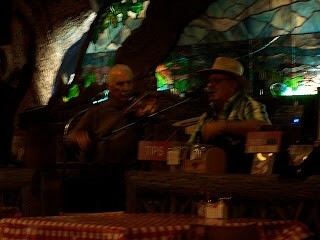 You could easily identify the locals because they knew all the old-timers in the band. Like the atmosphere, the food at Prejean’s is everything a tourist should expect Cajun cuisine to be – spicy and delicious. Nevermind the fact that crawfish season ended nearly three months ago. Tourists don’t concern themselves with the mating cycles of mudbugs. When they come to a Cajun restaurant in Lafayette, Louisiana, they expect to be gettin’ some doggone crawfish. Prejean’s is happy to oblige. 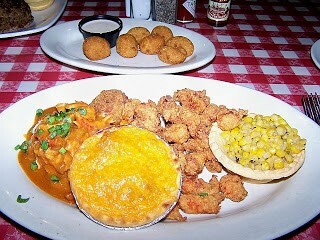 I ordered the crawfish platter—crawfish bisque, crawfish pie, fried crawfish and crawfish etouffee. It also came with crab bisque, crab au-gratin, hush puppies and a smoked corn pie thingy on the side. 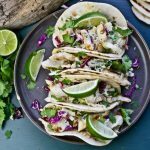 Each dish is prepared with so many delicious spices, sauces and seasonings, where do I start? The crawfish pie was a life-changing experience. I’ve always wanted to try one and here was my chance. It didn’t disappoint. A small pie crust topped with a layer of baked cheese. Inside was a delicious mixture of crawfish, cheese, and spice. Let’s put it this way, Prejean’s crawfish pie is now on my list of the top things I’ve ever eaten in my life. The fried crawfish was excellent too with the perfect amount of seasoning in the batter. The etouffee was also delicious, generously smothered over crawfish and white rice. Not spicy at all, but very tasty. The crab bisque was unbelievable. Thick, spicy corn chowder loaded with crab. What made it so decadent was the pools of melted butter floating in every spoonful. It had to be the richest soup I’ve ever tried. I’m not sure if authentic Cajun cuisine has to be spicy, but that’s what the tourists expect. Prejean’s really delivered on that with the crab au-gratin, by far the most mouth-tingling dish on the table. It was a casserole of crab, melted white cheese and lots and lots of spice. Regrettably, I couldn’t even finish it all – a rare occurrence for me, and a tragedy in this case. But I’ll be back. I’m not ashamed to admit it. I’ll gladly stand in line with tourists for food and atmosphere this good. Can Taking A Break To Travel Be The Best Career Move You’ve Ever Made? Visit America’s Five Most Haunted Houses – If You Dare!